She pretends to bite and then grins cheekily at you. She is very clever about getting what she wants even if you've said no - including my special dairy and soya free chocolate and she knows she's been naughty! The grin is so cheeky it's unbelievable. I decided whilst pregnant with Mary to make our lives what we wanted and began to think how we could get out of the negative feedback loops we had found ourselves in. I wanted to guide where we were going rather than just reacting to events - having decided on what was needed and what was wanted and examining the intersection luck and family and friends helped us out. I love this guys thoughts on this especially as I grow my creativity networks via Artournament Glos and Centre Arts (for arty-ness), Hack Space Bristol and friends for geekery and social networks for interest groups and publishing oppitunities - I am now in the Positive Creativity Feedback loop and am nearing my tipping point. I really feel that things are starting to take off. The last few months have been amazing with winning medals for songs, getting invited to other counties to read my poetry, having my art work shown in science cons, getting short stories published and being booked for more and more festivals to do my crafts. I am completing projects that I started at Uni. It really is amazing and it seems to fitting in with having the girls as well. But more than this - part of the issue is that we really were in a feedback loop of negativity before - if things are on the edge like say finances are tight when things go wrong there is no buffer, no safety net and so things are worse and the impact of the next thing to go wrong is even worse. Now you can try and plan for these but most people will not be able to cope with more than two big things going wrong at once or in close succession - even on the business course I took they admitted this, including the bank guy. The issue is breaking out of the loop, to a certain extent you have to reboot the system, you have to crash the situation you are in. In giving up and going to the CAB we basically began to take control of our lives again. It is a bizar apparent contradiction. But I gave up struggling to follow the career path I felt SHOULD be followed, the prescribed course that was supposed to happen - it had been shot in the foot by circumstances out of my control. In trying to cling to it I made things worse, in trying to maintain the apparent control in the increasingly ever desperate situation, I helped send us off even more erratically into the network of fail loops that bound us. We forgot to assess things, everything seemed running away with us and to be pivoting out of control. But it became apparent that the core of us was resilant to this. The US was still an us, we the family and so the reassessment - the important thing? Me, Al and the girl/s. Strip it back to basics and build the new system on this. But there was something else - I needed to do what I enjoyed, the things I was passionate about that I could still do. Moon rocks and impact lithologies denied to me I turned to the more arty things -things that began to grow. They had been growing before but when I tried to force things it didn't work. So I just enjoyed it and it began to flourish. And opportunities began to present themselves to me. Alaric's theory with this is that if you do what you are enthusiastic about the more you notice or are noticed by those who provide the opportunities in that field. Getting to meet the right people in the first place can be hard and then you can find yourself up against the Old Boys Club. But we are lucky, there is the internet and I have verbal diarhea (even if I can't spell it!) and so things found me or dropped into my radar senses on the internet and now the networks, real and electronic are meshing and melding and growing new constructs which appear to be a career for me. Also just as a little aside many of you know that I feel that creativity is above Science and Art and that they are simply different uses of the creativity. The thing with feedback loops is that I do very much feel that science and art feed into each other - this does not mean one is the other but more that they support each other and are essential for the continued development of each other. Science needs art - to communicate and teach and to show the wonders that are there or are being hunted for and Art is forever in need of new inspiration and on a more practicle level new substrates and mediums to work in. Increasingly I note science friends who are artists on the side or as full time and art/writer friends who have found science isn't the dead subject they were shown at school and who have gone back and have or are currently studying science at some sort of further education level. This is the song I won the bronze for in the Gloucestershire Creative Olympics - as far as I can tell it is ok for me to put this up now as the event has been and gone. I found out about the competition with three days to go so wrote the song, revised it and recorded it wrote on the CD and posted it. I had a cold at the time but I am still happy with it. This is for all of you who moaned at me for not telling them I had this song! Jean lost her second tooth in the new house yesterday and spent the day worrying that they wouldn't find it as we still haven't found the tooth cusion I'd made her. She was also doing lots of wondering about how the tooth fairy would get into the house and lift the tooth and swap the money and did they go big/small, or could they walk through walls and were they a boy or a girl? So she left a letter. And the tooth fairy answered it. I thought it was just pictures but Jean pointed out it was a letter written in Fairy Language so she immediatly demanded to go on the computer to see if wikipedia could help her translate it. But after some google searching it became evident that there are lots of different fairy languages and dialects and when Jean looked closer she found that the symbols were very toothy and so we came to the conclusion that this is a specific tooth fairy language. There are teeth and pliers and ladders and pillows and moons. I told Jean we would probably have to wait until Daddy got home and she could work at translating it with him. She looked very serious and took the letter and sat staring at it about ten minutes later she announced that this symbol was M and this symbol N and before long she had worked out the second word was Jean. 'It now sort of looks like Jean as well Mummy' and she's right it does. She got the first few lines translated before school. And there was me thinking I would have to phone Tooth Head Quarters and ask for a key so we could find out what the letter ment. Of course as the fairy borrowed one of mummy's pens Jean did initially accuse me of writing the letter until I pointed out I couldn't read what it said. Friday saw me in Stroud for my frist ever poetry slam - and I was so nervous. 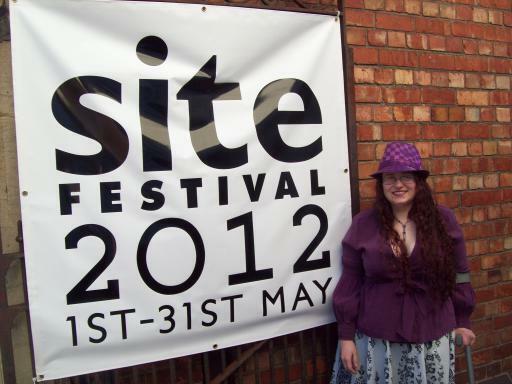 It was part of the Stroud Site Festival and was run by Marcus Moore and Sara-Jane Arbury. Over the last few years I have done quiet alot of poetry readings including some performance stuff but not a slam. Not a situation where I felt I had to have the poem memorised. I did a Flash Fiction Slam in Oxford about two weeks ago but again I was reading from sheets of paper. My mother keeps saying it's the same as when I did acting but I was mostly back ground people and had a few words or sentences punctuated by other people which acted as prompts. As a result I performed No Wage Slave as that was the one I am the strongest with having performed it so much recently. 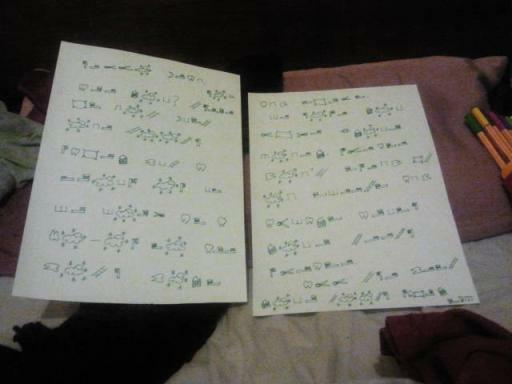 I also now have I Hate Race Week and Hopscotch (most the time) memorised. I am working on memorising more. On top of that I've been looking at Science Communication courses but then found myself being asked if I could come in and give a talk to scientists about using art and crafts to help with thought patterns and communication. So am re-thinking this especially as there are only burseries for doing it full time which would defeat it being part of what I have already built up. As it is I am pretty much booked up for the summer and now have a couple of events already in the calendar for the Autumn. I am trying to learn to drive mainly as my main limitation at the moment is how to get home from performances and events etc... I would love to do more stage stuff, maybe some TV and radio too. Which was part of why I was looking at the Science Communication courses - its the work placements and the science writing I would like. Not sure if I told everyone I now have a home page / hub for my various websites - it is not all that good at the moment but I am getting little time to work on it at the mo! Also I now only need Â£15 for the sensory cave to be built but I am running out of time! So please sponsor me there are lots of fab things I am willing to send people who back my project and extra money goes towards a science-art exhibition in March next year that I am organising with a local art gallery.